TeamSpeak 3 is voice-over-internet protocol (VOIP) software. It provides audio communication features, that can be used online gaming, educational training, internal business communication, and staying in touch with friends and family. TeamSpeak is easy to use and offers high security standards, excellent audio quality, and low system and bandwidth usage. Featuring a client-server architecture, TeamSpeak 3 is literally capable of handling up to thousands of simultaneous users. In this tutorial we will guide you through the steps of installing TeamSpeak 3 Server on a CentOS 7 VPS. First thing you need to do is to log in to your CentOS 7 VPS via SSH as user root. Before installing TeamSpeak Server it is recommended to update all packages installed on your server. 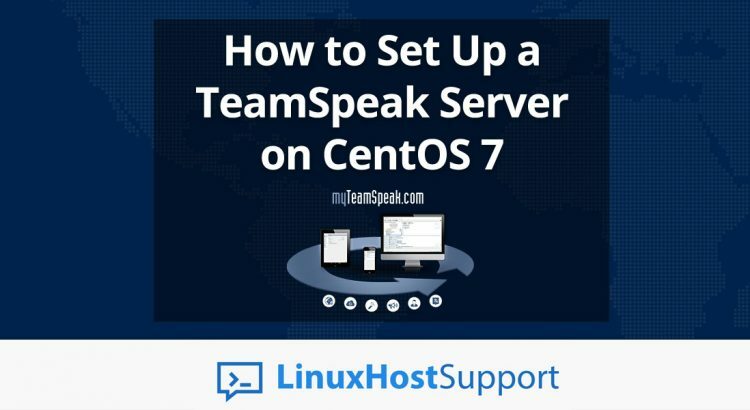 Installing TeamSpeak on a CentOS 7 server is an easy task if you are using one of our Linux Host Support Services. Feel free to ask our expert Linux Administrators to install TeamSpeak on a CentOS 7 these for you, and it will be taken care of immediately. They are available 24×7, so you can get the help you need at any time. PS. Feel free to share this blog post if you liked it by using the social network shortcuts – you can also leave a comment instead, found under the share buttons.